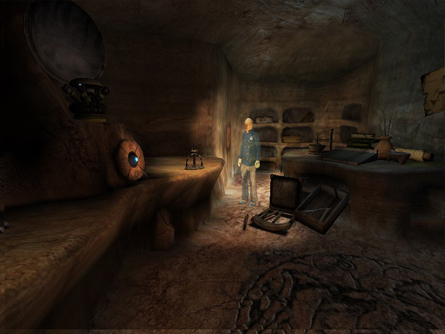 After Uru Lives closure in 2004 and the reopening in 2006 with Myst Online: Uru Live, new players to the game found a big change to how things started out. Cyan had done away with starting out in The Cleft and players started out in Relto, the reason behind this was to enable players to connect with the community quicker. Instead of starting the game in The Cleft, going to Relto then from there going to the Neighbourhood (ala Uru ABM/Live). The player only had to go from Relto to the Neighbourhood in MOUL they could then return to The Cleft later to pick up a page that allowed the start of “The Journey”. The merits of this speaks for itself, it allowed people to dive in and meet up with friends or with new friends. However the change left a lot to be desired along with a few issues in story element. How did the players end up with the Relto Books for example? With older players returning the In Character excuse of “it’s my old book” works here, but what with the new players? I feel they lost something starting out in a mysterious place, not speaking with Zandi before they started (who’s cryptic remarks foreshadows the mystery of the journey ahead). So how could this be fixed? Well it is something I have been thinking about for a while, trying to cover all the angles that I can see and the following is my suggestion. But not only is it my suggestion my proposal also addresses another problem I have found since first playing the Uru games back in 2003. Choice, is to a degree, an illusion in this game which is unfortunate. When I first found out about Uru back in the DIRT and MUDPIE days. The first glimpses were of The Great Shaft and the concept of being able to walk down into D’ni was something on my mind, something that I yearn to see even now. When players start at The Cleft in Uru they are forced to take Yeesha’s route to D’ni by going via Relto. As some players may not like Yeesha they wouldn’t want to take her route, indeed some may be DRC supporters and want to take their route into the Cavern (although Yeesha and DRC are all the same these days which is something I may address in the future), they may just be D’ni History nuts like myself and want to take the tunnels for the sake of it, but the underlying point is that choice should exist. 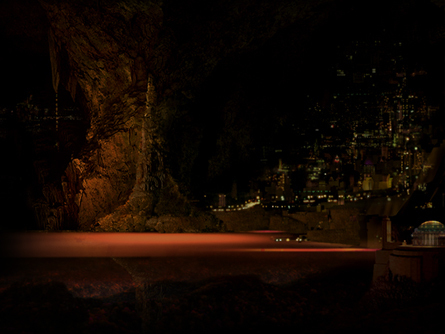 And so my proposal for the start of Uru also involves the concept of heading down to D’ni via the tunnels. The concept of starting at The Cleft is back and as it should be, but what about getting to the community faster you ask? Well that’s not a problem because The Cleft you start out in is a Public Area. It stands to reason that if you were trekking into the desert to take this journey that others would be doing the same and as such you would bump into them. 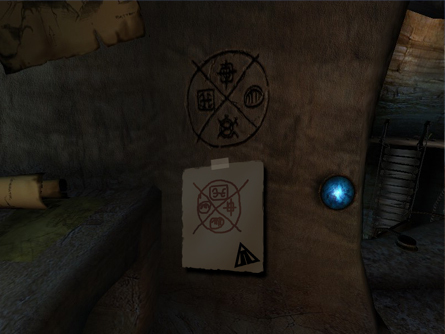 Problem: Puzzles already being solved. Potential Solution: The only really big puzzle in The Cleft is getting the power working, and watching the message. The answer to the imager combination is readily available in the room the imager is in anyway so that isn’t much of an issue. As for the power I’m sure it is possible to have the wind mill stop after a while of being activated. Potential Solution: I have 2 suggestions for this, one being a box full of books (like the T shirts in Kirel) that the player picks up and Links out using. Or have the books on the pedestal but once the player has picked it up there is a Bahro scream (like there is already when you link out after picking the page up there in MOUL) and a new book appearing for the next player. An optimization: A bit of a side step here, a lot of comments I have seen is in regards to picking up and documentation on the KI, the communication device within the game. I mention this here because it ties in with the following section about taking the trip to D’ni the tunnels. The idea I had was to use the imager in The Cleft, upon the wall where Yeesha’s imager combination is could be a note by the DRC with a separate combination, upon entering the combination Victor Laxman appears and proceeds to explain the KI that the KI can be picked up in Gahreesen or in Descent (for those taking the non-Yeesha route), maybe touch on who the DRC are to introduce new players. Given that Laxman is the DRC’s technology guru it is also in keeping with the storyline. 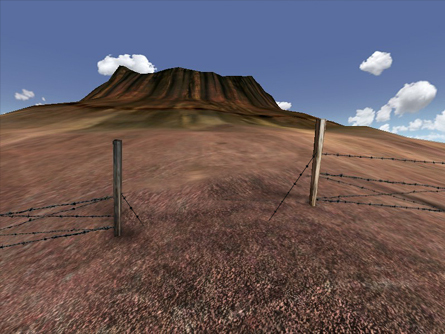 Those who play Uru are aware that the volcano has a fence around it, in this proposal the fence will have a section that you can walk through. This will lead you to the edge of the caldera where you can descend down the rope ladder into the caldera and from there into the tunnels. Each Eder Tomahn (Rest House) has in it a Nexus point, I’m not sure if each one had a KI machine in too but I know at least 1 does. In MOUL the Eder Tomahn half way down the Great Shaft has a KI machine that offers a lighting option to the players KI. This machine could be utilized to first offer the KI and then offer the light if the player already has the KI. If not then then player could get the KI from one of the Eder Tomahn they stumble upon before they start venturing down the Great Shaft. 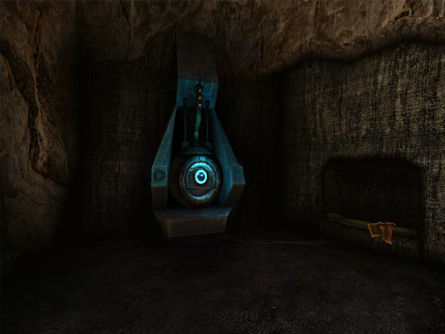 The Nexus points could serve as “save points” along the way given that the journey through the tunnels are long and allows the player to revisit specific points of the journey. Problems: Long time to travel. Potential Solution: Nexus save points as mentioned above. Potential Solution: We know that segments of the tunnels have collapsed, in order to get around it perhaps Linking is needed, upon linking to the next stage you separate from the public Cleft district and into a private/public/hood Descent district. Upon arriving in the Caverns shores the means to get to Ae’gura will be needed. I see a couple of possibilities here. The shores provide an area for people to explore which provides a means to get to Ae’gura via another Age. There is of course an inherent problem if you do not take the Yeesha route, one is Panic Linking and the other is you do not have a personal area that you get with Relto. Players could be issued a house in a district of D’ni if they didn’t take the Relto route. The house offers a room and maybe a courtyard in which the player can wander around, within the room would be a bed, the 2 shelves for books and the wardrobe for clothing. A Link to this house could be found in the Nexus. Problem: No Relto book, means Panic Linking problems. Potential Solution: The Bahro, they look out for the players after all, if a person falls then a scream would trigger and the player would be Linked back to their D’ni house. Problem: Relto Page like Rewards. Potential Solution: Different rewards structures similar rewards with a D’ni lean to them instead of Yeesha. Maybe D’ni artifacts instead of things like Er’cana plants. Course this may cause complaints about “unfairness” of some people not being able to be equal in the rewards they get. Potential Solution: I see this as similar to inviting friends to an Age, you would send a nexus invite and they would turn up (they would Link to the courtyard thus allowing you to have the door to your house open or closed like Relto). Now we need to take into consideration the possibility of being able to return to the Cleft for the Relto book if you took the Tunnel route. After all it is possible that Joe Explorer might decide that having followed the DRC he wants to give Yeesha a chance. This means if Joe Explorer gets his Relto book then he now has a house in D’ni and a house in Relto. At least this addresses the concerns of those who will no doubt complain about the unfairness of the rewards structure between the 2 house versions. In order for a “Tunnel Walker” to become a Relto user, they would need to walk back up through the tunnel back to the public Cleft and grab the book to Relto. 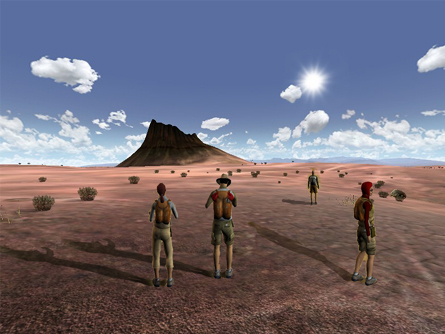 At that point the game mechanism in dealing with The Cleft would be the same as the past versions, the Cleft is out of bounds until they have completed the Journey. Once the Journey has been completed then they would get the Rainy Cleft, the Regular Private Cleft and the Public Version. Problem: Access to the public Cleft could be still found in the Tunnels. Potential Solution: I am thinking that the means to go from the Public Cleft tunnels to the private/public/hood tunnels could be a Bahro Stone, in which case the stone leading back from the private/public/hood tunnels to The Cleft tunnels would also be a Bahro stone, this stone could vanish until the Journey is completed. Aloy’s vision of Uru at the Guild of Writers Forum. Alahmnat’s take on the beginning of Uru at his Blog. Paradox’s take on the beginning of Uru at his Blog. Interesting. But I feel that, even were the cleft a public area, there still wouldn’t be anyone THERE most of the time, as it would only be inhabited by new players (or old exploreres with new Avatars) And Uru isn’t known for attracting new blood. That being said, such a dramatic overhaul/addition such as you suggest here could readily attract old players to replay the game from the DRC perspective, or at least to get a D’ni house just for the fun of it.